Ramat Gan (Hebrew: רָמַת גַּן) is a city in the Tel Aviv District of Israel, located east of Tel Aviv. It is home to one of the world's major diamond exchanges, and many high-tech industries. Ramat Gan was established in 1921 as a moshav, a communal farming settlement, and in 2017 it had a population of 156,277. The mayor of Ramat Gan is Carmel Shama. Ramat Gan was established by the Ir Ganim association in 1921 as a satellite town of Tel Aviv. The first plots of land were purchased between 1914–1918. The settlement was initially a moshava, a Zionist agricultural colony that grew wheat, barley and watermelons. The name of the settlement was changed to Ramat Gan (lit: Garden Height) in 1923. The settlement continued to operate as a moshava until 1933, although it achieved local council status in 1926. At this time it had 450 residents. In the 1940s, Ramat Gan became a battleground in the country's language war: A Yiddish language printing press in Ramat Gan was blown up by Hebrew-language extremists. Over the years, the economy shifted from agriculture to commerce and industry. By 1946, the population had grown to 12,000. 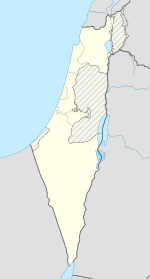 In 1950, Ramat Gan was recognized as a city. In 1955, it had a population of 55,000. The first mayor was Avraham Krinitzi who remained in office for 43 years. In 1961, the municipal area of Ramat Gan expanded eastward, to encompass the area that includes the Sheba Medical Center in Tel Hashomer and Bar Ilan University. In 1968, the world's largest diamond exchange opened in Ramat Gan. The Sheba Medical Center and the Israel Diamond Exchange are located in Ramat Gan. Ramat Gan is located in the Gush Dan metropolitan area east of Tel Aviv. It is bounded in the north by the Yarkon River and in the east by Bnei Brak. Giv'atayim lies to the southwest. Ramat Gan experiences an average of 500 mm (20 in) of rainfall per year and is located, on average 80 meters above sea level. It is built on limestone hills. Ramat Gan parks include The National Park which covers some 1,900 dunams, and David Park in the Merom Naveh neighborhood. 25% of Ramat Gan is covered by public parkland. Ramat Gan neighborhoods include: Shchunat Hageffen, City Center, Nachalat Ganim, Kiryat Krinitzi, Ramat Shikma, Ramat Yitzhak, Shchunat Rishonim, Tel Yehuda, Givat Geula, Neve Yehoshua, Kiryat Borochov, Merom Naveh, Ramat Amidar, Ramat Chen, Shikun Vatikim, Shchunat Hillel, Elite and Diamond Exchange District and Tel Binyamin. According to the 1931 census Ramat Gan had 975 inhabitants, in 253 houses. As of 2006[update], Ramat Gan had 129,700 residents, on an area of 12,000 dunams (12 km²). The population was growing at a rate of 1.0% per annum with 90% of this growth coming through natural increase. The population density of the city is 9,822.6 per square kilometer, one of the highest in Israel. In terms of the origin of Ramat Gan's residents, 42,900 originate from Europe and America, 10,200 from Africa, 29,200 from Asia, and 40,600 from Israel. 86,200 of the residents of Ramat Gan were born in Israel, whilst 36,600 were born abroad. 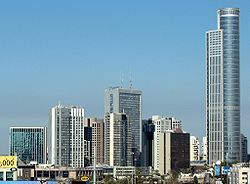 According to the Israel Central Bureau of Statistics, as of 2001, Ramat Gan's socioeconomic ranking stood at 8 out of 10. 70.9% of twelfth grade students received a matriculation certificate in 2000. That year, the average wages in Ramat Gan were 6,995 NIS. As of 2006[update], 32,100 of the city's households had people who were not in the labour force, with 23,300 of these retired. 1,900 of the households had unemployed within them. 43,000 households were fully employed. The largest sectors of jobs for those in employment in Ramat Gan were business activities accounting for 18.1% of jobs, education, 15.1%, wholesale and retail trade, and repairs, 14.2%, manufacturing 10.8%, and health, welfare and social work services, 10.0%. Ramat Gan's economy is dominated by the Diamond Exchange District in the northwest of the city, home to a large concentration of skyscrapers, including Moshe Aviv Tower (City Gate), Israel's tallest at over 240 metres (790 ft), the Israel Diamond Exchange (a world leader in diamonds), a large Sheraton hotel, and many high-tech businesses, among them Check Point Software Technologies and ArticlesBase. Also located in the Diamond Exchange District is the State Bank of India's Israeli headquarters and the headquarters of Bank Mizrachi, whilst the embassies of Ghana, Kenya, Ivory Coast, Jordan, Eritrea, Norway, Belgium, the Netherlands, and the European Economic Community, are located in the area. A number of other international embassies are also located in the city, as is the British Council. Also headquartered in the city is the Histadrut trade union. Located to the south of Ramat Gan is Hiriya, the largest waste transfer site in the Middle East. Ramat Gan is also an important center for industry and manufacturing with major fruit and vegetable canning plants, textile mills, metal production plants, electrical manufacturers, furniture makers, and food producers based here. Currently, the Elite Tower, set to exceed the Moshe Aviv Tower in height, is currently being built of the historic Elite Candy factory. As a tribute to the history of the site, the lower floors of the tower will house a chocolate museum. The tower is set to contain luxury apartments, with an average price tag of $1 million each. At the end of 2006, Ramat Gan had three hotels, with a total of 408 rooms with 150,000 person-nights over the year representing 64% room occupancy. The mayor of Ramat Gan is Carmel Shama. Ramat Gan is home to Israel's second largest university, Bar-Ilan University, with 24,000 students. The city is also the location of the Shenkar College of Engineering and Design, Ramat Gan College, the College of Law and Business, Beit Zvi acting college. Ramat Gan has 112 synagogues, two yeshivot, and a Kabbalah Center. Ramat Gan also has a Buddhist temple, and a Scientology center. The Sheba Medical Center located in southeastern Ramat Gan and Tel HaShomer, is Israel's largest hospital. It includes the Safra Children's Hospital and Padeh Geriatric Rehabilitation Center. The city has 32 medical centers run by health authorities and 10 child-care clinics operated by the municipality. Northwest of the city is an archeological site dating from the Early Bronze Age (2800–2600 BC) – Tel Gerisa – which has been identified as a Hyksos fortified town from 2000 to 1500 BC. Cultural venues in Ramat Gan include the Ramat Gan Theater, the Diamond Theater and the Russell Cultural Center. The Beit Zvi School of Performing Arts is based in Ramat Gan. Ramat Gan operates two cinemas complexes: the Lev-Elram Cinema and the "Yes Planet" megaplex. Beit Avraham Krinitzi, home of the first mayor, is now a museum of the history of Ramat Gan. The Harry Oppenheimer Diamond Museum tells the story of the Israeli diamond industry. Man and the Living World Museum is a natural history museum and the Maccabi Museum focuses on the history of Jewish sports since 1898. The Ramat Gan Safari, a 250-acre (1.0 km2) zoo housing 1,600 animals, is the largest animal collection in the Middle East. [dubious – discuss] Other museums in the city include the Museum of Israeli Art, Kiryat Omanut which houses sculpture galleries and a ceramics studio, the Museum of Russian Art, the Museum of Jewish Art, and the Yehiel Nahari Museum of Far Eastern Art. The Maccabiah Games are held in Ramat Gan every four years. Ramat Gan Stadium is Israel's national football stadium. Seating 41,583, it is the largest stadium in the country. Hakoah Amidar Ramat Gan and Hapoel Ramat Gan who both play at the Winter Stadium, are the city's main football clubs, both having won the championship at some point in their history. Beitar Ramat Gan plays in the South A Division of Liga Bet, the fourth tier, whilst F.C. Mahanaim Ramat Gan, Maccabi Hashikma Hen, Maccabi Spartak Ramat Gan and Shikun Vatikim Ramat Gan are all playing in the Tel Aviv Division of Liga Gimel, the fifth tier. The now-defunct clubs Maccabi Ramat Gan and Maccabi Ramat Amidar were both involved in mergers which formed Hakoah Amidar. In basketball, Ironi Ramat Gan plays in Ligat HaAl, the top division. ^ "Ramat Gan (Israel)". Retrieved April 6, 2008. ^ a b c d "Ramat Gan". Jewish Virtual Library. Retrieved April 6, 2008. ^ a b c "General Information". Ramat Gan Municipality. Archived from the original on March 27, 2008. Retrieved April 6, 2008. ^ Pilowsky, A: "Yiddish Alongside The Revival of Hebrew Public Polemics on the Status of Yiddish in Eretz Israel, 1907–1929", Readings in the Sociology of Jewish Languages, page 123. Joshua Fishman ed, Leiden – E.J. Brill, 1985. ^ "Ramat Gan". Retrieved April 6, 2008. ^ a b "Parks & Safari". Archived from the original on March 17, 2008. Retrieved April 6, 2008. ^ a b "Population Densities". Retrieved April 6, 2008. ^ a b "Sources of Population Growth". Retrieved April 6, 2008. ^ a b "Origins". Retrieved April 6, 2008. ^ a b c "Labour Force Characteristics". Retrieved April 6, 2008. ^ "Industry of employment". Retrieved April 6, 2008. ^ "Diamond Exchange Area turns into luxury residential spot". Jerusalem Post. Archived from the original on January 12, 2012. Retrieved April 6, 2008. ^ Ramat Gan. Encarta. Archived from the original on December 2, 2007. Retrieved April 6, 2008. ^ "Trump to build projects in Israel – Israel Money, Ynetnews". 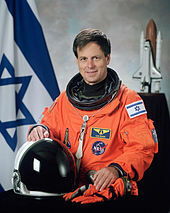 Ynetnews.com. June 20, 1995. Retrieved May 6, 2009. ^ Hotels. "Statistical Abstract of Israel 2007 – No. 58 Subject 23 – Table No. 11". Retrieved April 6, 2008. ^ "Academic Institutes". Archived from the original on March 17, 2008. Retrieved April 6, 2008. ^ "Our Faith". Archived from the original on July 21, 2009. Retrieved August 3, 2009. ^ Ayala Hurwicz (May 7, 2007). "Sheba – Largest Hospital in Israel" (in Hebrew). Retrieved September 14, 2007. ^ "Medical Services". Archived from the original on March 17, 2008. Retrieved April 6, 2008. ^ "Theatre & Cinema". Archived from the original on March 17, 2008. Retrieved April 6, 2008. ^ "Museums & Fine Art". Archived from the original on March 17, 2008. Retrieved April 6, 2008. ^ "Ramat Gan Twin Cities". Archived from the original on August 1, 2009. ^ "Strasbourg, Twin City". Strasbourg.eu & Communauté Urbaine. Archived from the original on July 28, 2013. Retrieved August 21, 2013. Wikimedia Commons has media related to Ramat Gan. Wikivoyage has a travel guide for Ramat Gan.